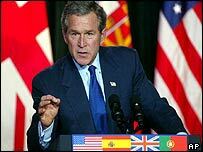 United States President George W Bush is to make a televised address at 0100 GMT on Tuesday to issue Saddam Hussein with a final ultimatum, following the collapse of diplomatic efforts to resolve the Iraq crisis. Mr Bush will warn the Iraqi leader that he has just 48 hours to go into exile or face war, Republican Senator John Warner said after Mr Bush had briefed congressional leaders. The 48-hour deadline was confirmed by US administration officials. Earlier, Iraq's Foreign Minister Naji Sabri dismissed such an ultimatum, saying "any child" in Iraq knew such a plan would fail. The US move comes after the US, Britain and Spain withdrew plans for a new United Nations resolution, faced with a French threat to veto it. French Foreign Minister Dominique de Villepin said Paris regretted the decision to abandon diplomacy and argued that resorting to force against Iraq was unjustified. UK Prime Minister Tony Blair suffered a blow with the resignation of Robin Cook - a senior cabinet member and leader of the House of Commons - who criticised what he feared would be a "military adventure". Meanwhile, the Turkish Government said it would reconsider urgently a US request for about 60,000 troops to use its soil for an attack on northern Iraq. Turkish parliamentarians narrowly voted against such a deployment earlier this month. 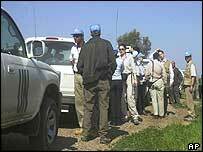 In a sign that war may be imminent, UN Secretary General Kofi Annan ordered all UN staff to leave Iraq and has suspended the country's oil-for-food programme. A total of 156 people working on the arms inspections as well as all 194 humanitarian workers are to be pulled out, UN officials said. Although Mr Annan did not say when the evacuation would begin, Hiro Ueki, a spokesman for the arms inspectorate indicated that they were likely to leave on Tuesday. 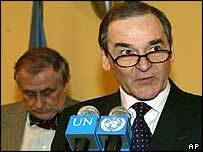 The British ambassador to the UN, Sir Jeremy Greenstock, blamed the withdrawal of a new resolution authorising force on France - without naming it - for threatening to use its veto whatever the circumstances. But his French counterpart Jean-Marc de la Sabliere said that "the majority of the Council confirmed they do not want a use of force". This claim was rejected by US ambassador John Negroponte, who insisted the vote would have been close. US Secretary of State Colin Powell said the Security Council had failed a test in its inability to unite behind an US-backed bid to disarm Iraq. But he stressed that the second resolution had not been a necessity, that the US had tried to gain one simply to "show the world we had taken one last step". The UK Government's most senior legal adviser, Attorney General Lord Goldsmith, says military action against Iraq is authorised under existing UN Security Council resolutions. In the UK Parliament, Mr Cook - a former foreign secretary - praised Mr Blair but urged MPs to vote for a rebel amendment in a debate on Tuesday "to stop the commitment of troops to a war which has neither international agreement or domestic support". He won an unprecedented standing ovation and applause - considered unparliamentary behaviour - from the back benches of his Labour Party. Earlier, UK Foreign Secretary Jack Straw told MPs that a failure to endorse a deadline in Tuesday's session "can only bring comfort to tyrants and emasculate the authority of the United Nations". Iraq state television quotes Saddam Hussein as saying that while Iraq had had weapons of mass destruction during the Iran-Iraq war, it did not have them now. Russia and Portugal tell their nationals to leave Iraq while diplomatic staff from China and other countries begin to withdraw. The US orders non-essential diplomats out of Kuwait, Israel and Syria as the UK tells all Britons, except diplomatic staff, to leave Kuwait. The BBC's Rageh Omaar in Baghdad says that despite an appearance of everyday normality, there is an unmistakeable sense of heightened anxiety in the Iraqi capital. 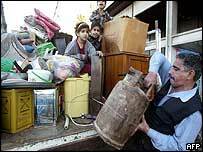 Defensive positions are being increased in the city, enormous queues have formed at petrol stations and government ministries are moving out their computers, faxes and other valuables. Saddam Hussein warned that if Iraq is attacked the battle will be "wherever there is sky, land and water in the entire world". US forces in the Gulf now exceed 250,000 personnel and both US and UK forces say they are ready for any military assault. "The Security Council was split and therefore irrelevant"